A paper-based thing-a-ma-jig? What are we, cavemen?! Check out our new Golden Ratio Calculator, where we’ve done the work for you. The Golden Ratio is the proportion of 1 to approximately 1.618, which is represented by the Greek symbol Φ (Phi). Like Pi, Phi is a number that goes on forever, so 1.618 is the short version. Phi can also expanded through the Fibonacci sequence, or simplified to the Rule of Thirds. We’re primarily a left-brain couple, so we like the idea of using a mathematical principle in our projects. We used Phi to design projects including a trellised pergola and a built-in unit in our sitting room. The ratio B D to A B is 1 to 1.618. Also, the ratio B C to C D is 1 to 1.618. These ratios are then reflected in the lower part of the pergola. 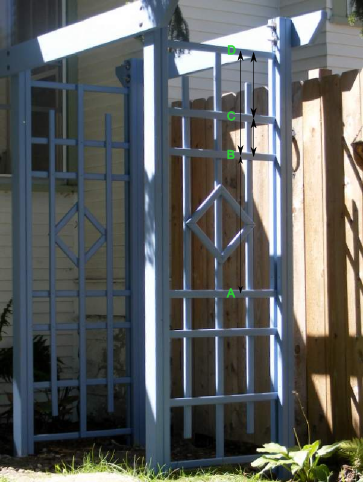 This is a small arbor we built as a gate arch. This photo was taken before we put the bars on the top. But it does show how we positioned the horizontal bars according to the Golden Ratio. We recently built a unit incorporating cabinetry and a fireplace. We spent quite a while drawing diagrams before we began construction, and incorporated Phi into the final version. The ratio A B to B C is 1 to 1.618. The Golden Ratio can also be seen in design elements in the pieces we used. 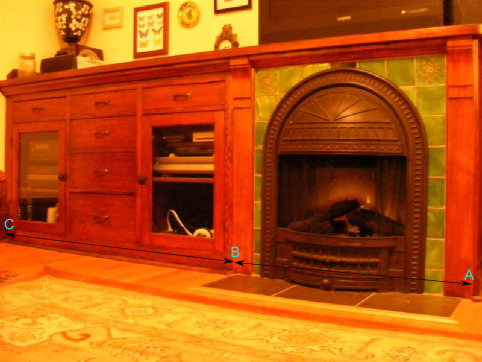 The heights of the drawer fronts on the repurposed cabinetry follow the ratio, as does the design of the fire surround. We can’t claim any credit for those, but it does demonstrate Phi’s prevalence. If you look for it, you will see the Golden Ratio everywhere. You can see it on cereal packets, in logos, in commercials, and, of course, on web pages. I think it’s always a good idea to incorporate the Golden Ratio at the design phase, whether you’re making greeting cards or building a house. Suckers that we are, we’ve historically worked out our designs on paper. With a pencil (and, more importantly, an eraser). But you don’t have to because I’ve built a Phi calculator for you. It will give you complimentary proportions for a figure, or split up a horizontal or vertical measurement in a Phi-friendly fashion. Please let us know how you end up using it in your projects. This entry was posted in Calculators, Construction, Decor, Furniture, Outdoor Building Projects, Repair & Maintenance. Bookmark the permalink.